On Sunday 31 May at 4:30PM, Space Ibiza will open its doors to welcome thousands of people who arrive to the White Island with the same goal, to dance together in one of the most anticipated parties of the year. The dance halls of the club at Playa d’en Bossa will be equipped with Funktion One and Pioneer DJ sound systems, in addition to professional lighting managed by Martin. As always, the Flight Club, which is one of the most impressive areas of Space Ibiza, will be set up and Ultra Music Festival will take over the Main Room. DJ Mag will take over the covered Terrace and elrow Ibiza will occupy the Sunset Terrace. El Salón and the Primere Étage will also be open, completing a total of six rooms. 37 artists will be responsible for putting on the soundtrack. 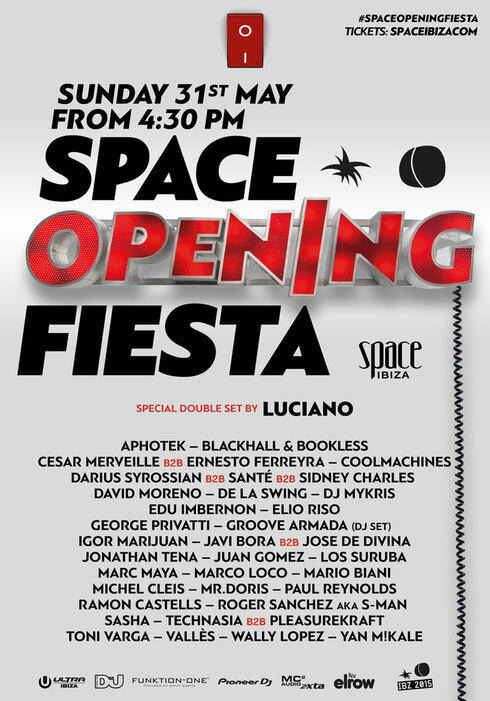 Luciano, who also has a residency at Vagabundos in Space Ibiza every Sunday from 7 June to 27 September, heads the full lineup. The Cadenza boss will have two sessions: he will be responsible for closing the Flight Club and continue at dawn on the Terraza. London duo Groove Armada (DJ Set) is another highlight and Sasha will also be present. There will also be artists such as Technasia and Pleasurekraft performing back to back, Roger Sánchez aka S-Man, Elio Riso, Blackhall and Bookless and DJ Mykris. Look out for Spanish talent such as Los Suruba B2B Edu Imbernon, Wally Lopez, David Moreno, Igor Marijuan, Vallès, coolMachines, Jonathan Tena, Juan Gomez, Aphotek and YanM!kale. Representing the Cadenza label are Michel Cleis and Ernesto Ferreyra B2B Cesar Merveille; and to close-out the Main Room will be Santé B2B Sydney Charles B2B Darius Syrossian. elrow Ibiza residents include De La Swing, Toni Varga, Marc Maya and Mario Biani B2B George Privatti, in addition to regulars Marco Loco, Mr. Doris, Paul Reynolds, Ramon Castells and Javi Bora, who will spin back to back with veteran Jose de Divina. The event will be streamed live through Be-At.TV, Ibiza Sónica and Ibiza Global Radio.